After a big sell off in these stocks, both Krono and Malton is attempting to start a new daily uptrend. There are signs of buying interest as volume surges. The process of bottoming may take some time and when a stock shows signs that it wants to start a new uptrend, traders should put them on the watchlist. Let us start off with Kronologi. As you can see from the chart above, Krono was in a nasty downtrend for quite a long time. The stock was moving downwards and it was trading below the 20 MA as well as the 50 MA. There was a sharp rally back up around April but it has since meandered sideways for a few months. What is evident is the stock is consolidating. We can call this process of moving sideways after a downtrend "basing". The stock is also making higher lows and this signals potential strength in the stock. If it was weak, it would have gone lower. But it did not. The stock is now trading back above its 50 MA. The 20 MA is also attempting to go back above the 50 MA which can be a sign of the start of a new uptrend. The area below the consolidation will be support and if Krono manages to breakout above the consolidation, a possible nice uptrend may follow. Also notice the heavy volume which hints to investors buying interest in anticipation of a possible new daily uptrend. The weekly chart helps to tell the story of a stock that is really serious in finding a bottom and starting a new uptrend. 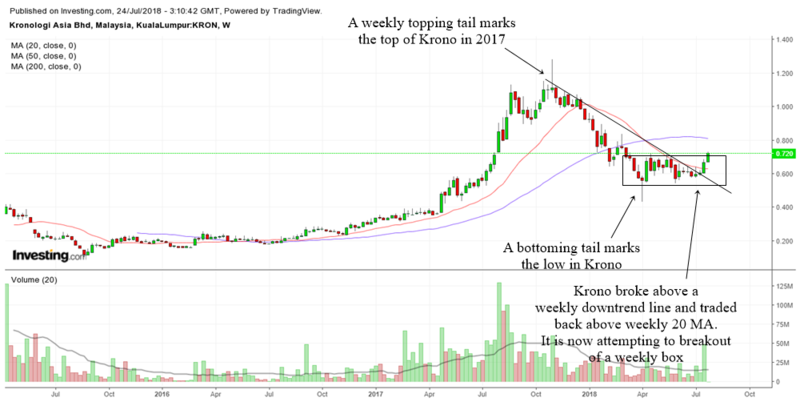 The value of using Japanese Candlesticks can be seen when a weekly topping tail marks the top for Krono back in 2017. Then a bottoming tail helps to mark the bottom for the stock. 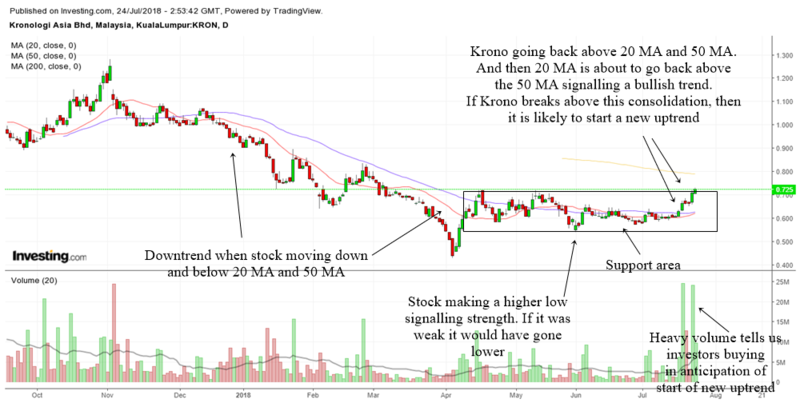 So do put Krono on your watchlist and see if it can go higher. 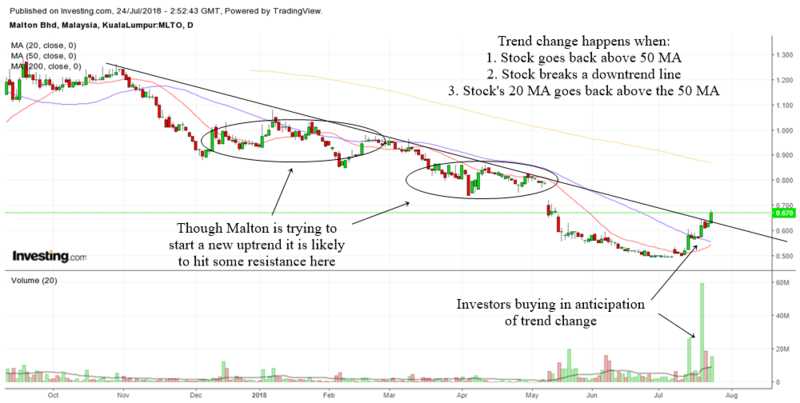 Malton is also trying to start a new uptrend in the daily chart. A look at the chart tells us that Malton is weaker than Krono. 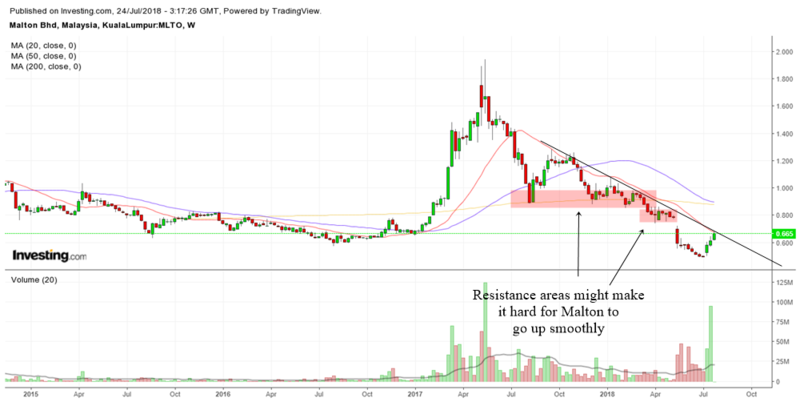 Although there is heavy volume that shows buying interest, the amount of resistance above might make it hard for Malton to move smoothly upwards. Malton might be trying to do all the above though its still too early to say. Preferably we should see Malton trading back above its 200 MA. The weekly chart above also shows us a clearer picture of the amount of resistance areas that is waiting for Malton. So do keep that in mind.